Yecheon-gun is an ideal spot with high Sobaeksan mountain, Nakdonggang river and Naeseongcheon. It is the region of clean water and kind people. Loyal subject Yakpocheongtak rescued Yi Sun-shin from capital punishment,and made him defeat enemies in Myeongnyang Battle during Japanese Invasion of Korea in 1592. Filial son Dosibok in the region was written in Myungshimbogam. Famous tourist attractions are Hoeryongpo, Samgang's Inn, Yecheon Hot Springs, Jinho International Archery Field in Yecheon and Yecheon Astro-Space Center. The special products include Mongolian rice (Mebang: Rice) Rice, Yuquan Chamuu (Beef), Sesame Spring Festival, Mulberry, Kaito Specialties, Yuquan Blue Chilli etc. Hoeryongpo village, which is adjacent to Naeseongcheon, is “the island in the land”. However, it is not a perfect island as the one side of the island adjoins the land. Hoeryongpo in Yecheon has been called as the best water village of Korea. The flow of Naeseongcheon, a branch of the Nakdonggang river, comes down around the village. Hoeryongpo village, which is adjacent to Naeseongcheon, is “the island in the land”. However, it is not a perfect island as the one side of the island adjoins the land. But the island village with blue river and golden sandy beach looks so amazing. You can overlook Hoeryongpo in Hoeryongdae of Biryongsan in Yonggung-myeon. Hoeryongpo under Hoeryongdae adjoins the land narrowly. It means that the flow of the water is so rapid. Hoeryongpo is a typical riverside village of Yeongnam where 15 local people of 9 families live together. I just crossed “Ppyongppyong bridge” over sandy field. Since it is a Cheonpan bridge used in construction site, it is so fun. 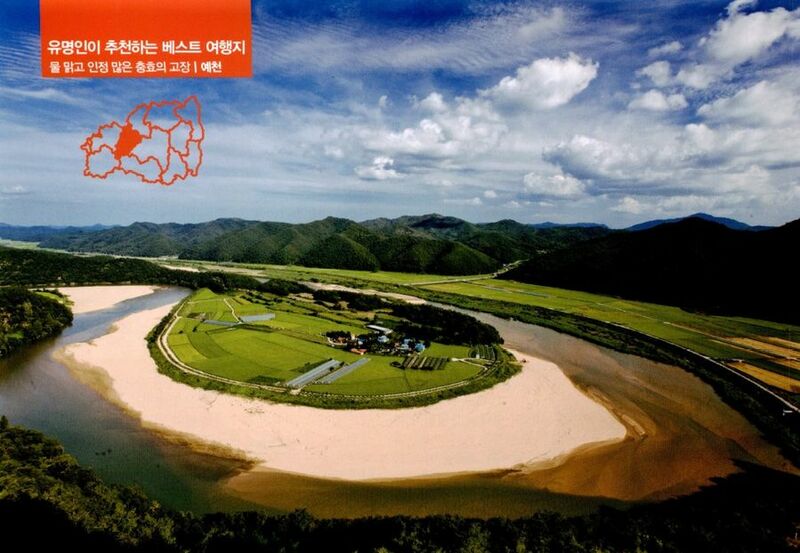 The region was the filming site of the famous KBS TV drama “Autumn in My Heart”. The hero and the heroin of the drama played pleasantly when they were children. Those who remember the beautiful scene would be deeply moved. The region was also shown in “1 Night 2 Days” in 2009, so you can experience the real programs. As it is the country village, Hoeryongpo village is so peaceful. Kind local people earn a living by rice farming and red pepper farming. 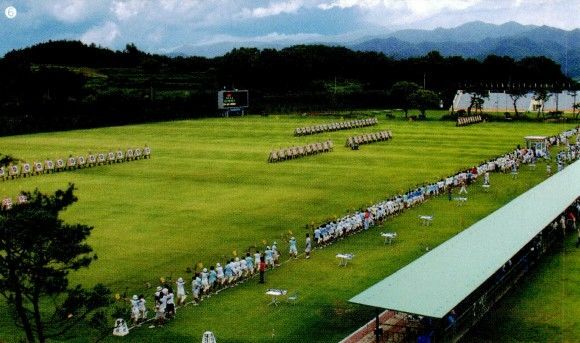 12,889㎡ including rice paddy and the land of village hall. I hope the tree became reliable taxpayer for a long time. Jangansa temple is located in the middle of Biryongsan, which was established by Unmoon daesa. After Silla had united three countries, it built three Jangansa temples around the country for national prosperity. They are in Geumgangsan, Yangsan and Biryongsan. Lee Gyu-Bo wrote a lot of books while staying here, and many local people devoted themselves to their studies. Biryongsan is not so steep that you can take a walk after looking around Hoeryongpo. Wonsan castle in Biryongsan is also good to visit. Samgang's Inn also attracts people's attention. Samgang dock where Naeseongcheon and Geumcheon flow into Nakdonggang river was the important traffic center in the past. 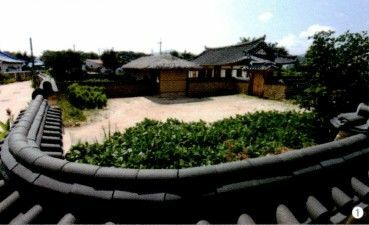 Classical scholars and merchants took a rest here in the Joseon dynasty period, and travelers crossed the Nakdonggang river in the ferry. Yecheon, which has a number of beautiful old houses, is the education center for Confucianism culture. Why don't you walk around antique Doldam-gil with your children? Geumdangsil traditional village is located nearby Geumgokcheon. It has amazing natural landscape. I agree that the King Taejo Lee Sung-gye wanted to make it the capital of Joseon. It is full of tourist attractions like mansion with 99 rooms, head house and Yongmunsa temple. In particular, the head house with 500 years old juniper is famous architecture as nobility of the Joseon dynasty period could see the beautiful landscape of the nature at once. Moreover, you can see the life style of yangban from Daedongwoonbugoonok(No. 878 national treasure) and Chogan diary(No. 879 national treasure). There are a lot of old houses like Geumgok Seowon, Bansong jaegotaek(No. 262 cultural property) and Sagwidang old house(No. 337 cultural property). The village is the real educational center for Confucianism culture. It is the village with a long history, so hundreds years of trees are standing everywhere. Over 100 years old pine tree, which is 800m long, is located nearby Yongmoon Middle School. The village has run experience programs of traditional village. Adults can feel the warmth of country, and children can realize the preciousness of farm village. In Yongmunsa temple of Yecheon, Taejo Wang Geon set an aim in life to suppress the world. Since there are a number of national treasures like Rotating Sutra Case, Yongmunsa temple gyoji, wooden image of Buddha, Wooden Panel with Buddhist Images in Relief and Daejangjeon Hall, it takes a quarter of a day to look around the temple. 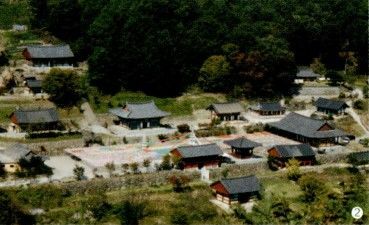 In particular, Yongmunsa temple is the only temple that has Yunchangdae among 1,000 temples in Korea. Wooden furniture was used to pray the Land of Happiness after putting Buddhist scriptures in it, and turning knob. It is so beautiful that a lot of people admire it. Daejangjeon hall looks simple, but it is an amazing architecture. Seongbo relic, which was completed in 30, October in 2006, has been mixed with both modern style and traditional style. There are 200 relics like altar portraits of Buddha, ceremony tools, records and other treasures in exhibition hall. Rotating Sutra Case looks just like the real one. Yecheon is the world of experience now! The events are beyond imagination. 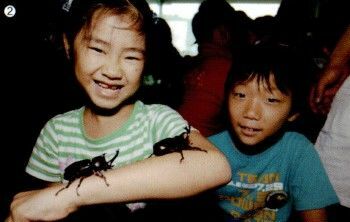 You can see the nature and insects on the spot, and try touching alive insects. You can enjoy the nature within your life in Yecheon insect ecology park. You can learn the variety and evolution of insects in insect history exhibition hall, see the various environment for insects in insect ecology exhibition hall. You can realize that insects have been used for human beings as natural resources. Various programs like making trees, raising the larva of beetle are supposed to be operated in Yecheon insect ecology park. Yecheon has been the region of Korean archery for thousands years. 60% of bows in Korea have been produced in the region. The local people have enjoyed bows and archery from old times, so some people say that they grab bows when they toddle, and pull a string when they finish the Thousand-Character Classic. It is not a coincidence that the archer Kim Jin-ho achieved five-time World champion in 1979, and participated in a competition in summer season. Anyone can enjoy archery since training staff operate archery experience program in Jinho International Archery Field in Yecheon. Moreover, it would be more exciting as the video and subtitles are shown on electronic display board at any time. You don't need to bring bow and arrow, but you should be patient and modest. 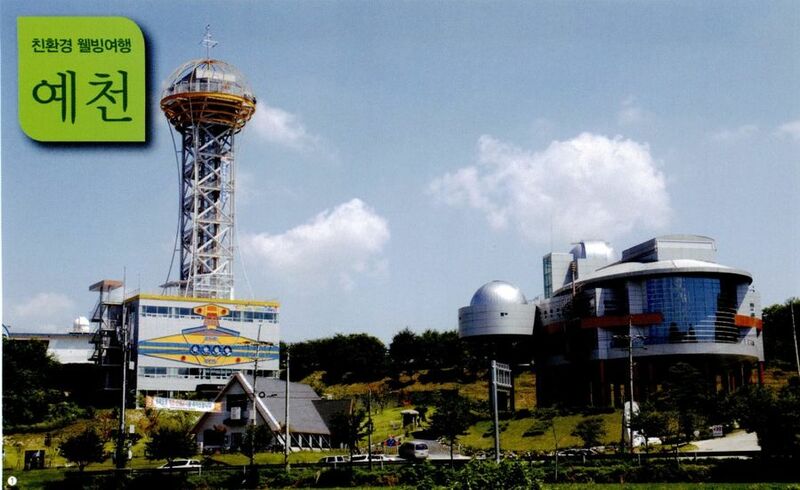 Those who love stars, the night sky, the space can make their dream come true in Yecheon Astro-Space Center. All people like the stars in the sky and the space. 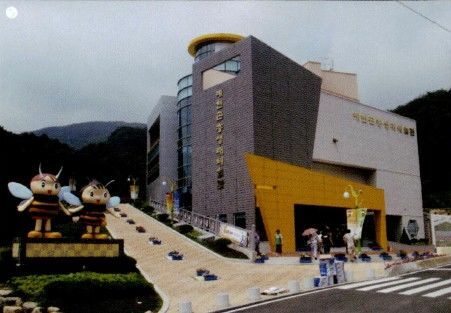 Yecheon Astro-Space Center is a rare place for both parents and children to enjoy the space. You can observe the space with human dream in Yecheon Astro-Space Center. And you can spend some quality time with your family and friends under the beautiful night sky. 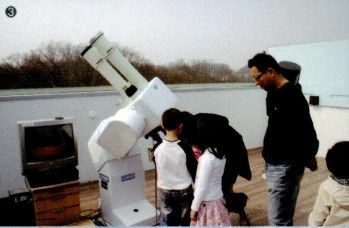 Various programs like one day course of a trip, 1 night 2 day course, special camp course have been operated, so you can observe the sun and night view. It is not large, but it is famous hot spring with clean water. The origin of Yecheon Hot Springs went back to the early Joseon period. According to “the Annals of the Joseon Dynasty”, King Sunjo said, “There's no medicine in the world that could cure me. I would be died soon. But some people say they cured their disease in hot springs. A long ago, the King cured his disease by taking a bath, and some Kings visited Onyang springs and Yecheon springs. How dare you disturb me?” Recently, it has been found out that the ingredients of Onjeong in Geumgangsan are the same with those of hot springs. And people pay their attention to it as it is good for skin care. Yecheon Hot Springs are the most famous tourist attractions of Yecheon, and they have attracted 1,200 people a day. Ministry of Public Administration and Security selected the road as one of “10 best green roads in my village” in 2011 for construction business for Eco-friendly living space. When overlooking Hoeryongpo village from Hoeryongdae observatory, you would exclaim. The course of a river and water drop village look like a piece of the picture. 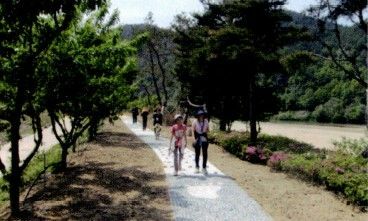 “Samgang~Hoeryongpo Gangbyeon-gil”, motivated from Samgang's Inn and Hoeryongpo, consists of Samgang Gangbyeon-gil, Eco Trail, Hoeryongpo road, Pyongpyong bridge, Naeseongcheon Gangbyeon-gil and Biryong woodland path. Ministry of Public Administration and Security selected the road as one of “10 best green roads in my village”. You can walk on barefoot in Hoeryongpo sandy road and Gwageo-gil of Samgang's Inn. You can also participate in special experience programs like Hwangdo dyeing, straw craft, inn stay and yangban bicycle riding. Samgang dock is located in the meeting point of Nakdonggang river, Naeseongcheon and Geuncheon, and it is the northernmost ferry of Nakdonggang river. You can walk along Samgang in Samgang Gangbyeon-gil in Pungyang-myeon, Yecheon-gun. In the past, peddlers brought goods from Samgang ferry and sold them while walking around the neighboring provinces. You can know joys and sorrows of them in Samgang Gangbyeon-gil where peddlers carried a load on their back. Most tourists depart from Samgang Inn, and look around 500 hundreds years old locust tree. And then they walk along Jebang-gil of riverside of Nakdonggang river. Naeseongcheon, the branch of Nakdonggang river, flows around Hoeryongpo Gangbyeon-gil. It is like an island village in the land. Naeseongcheon flows around “Muldori village”. Hoeryongpo means “the dragon twists around the village”. The combination of the mountain and the river is awesome. After passing by Jangansa temple and climbing Hoeryongdae, you can see the beautiful landscape of Hoeryongpo. After passing by Wonsanseong and Biryongsan trail, you can overlook Samgang Inn from the observatory. The fine sandy beach stretches out in front of Hoeryongpo. Moreover, you would have fun when crossing Pyongpyong bridge connecting the village.